As Executive Chef at the Georgia International Convention Center, David Bidwell creates innovative menus with unparalleled insight and skillful execution of all food served throughout the convention center. From elaborate corporate functions and prestigious gala’s to customized concessions in the exhibit halls, his mission at the GICC is to provide restaurant-quality culinary creations coupled with a personalized style of presentation and outstanding service. Following his graduation from Oshkosh Technical School for hospitality, Chef Bidwell did his apprenticeship at the Five-Star European Resort in Wisconsin and trained under Corporate Executive Chefs Bernard Kaufman & Klaus Hendrick. Bidwell then served in the US military from 1969-1971 as 9th Infantry in Vietnam. After serving in the military, Bidwell joined Hyatt Regency Chicago as restaurant Chef and also worked in banquets and ice sculpting. He transferred to Hyatt Regency Milwaukee as Executive Sous Chef and went on to become Executive Chef Hyatt Burlingame, CA, Hyatt Minneapolis, MN, Hyatt Dearborn Michigan and Hyatt Atlanta for nine years as Regional Executive Chef. 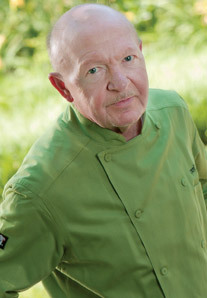 Following his Hyatt days, Chef Bidwell became Senior Executive Chef for the Georgia World Congress Center, under MGR Food Services and later Levy Restaurants for 14 years where he truly demonstrated how fine dining can be synonymous with venue food services. Bidwell was also instrumental in the culinary operations for Summer Olympics in 1996 overseeing seven venues, the NFL Superbowl pre-game and post-game hospitality suites and even landed a spot in the Guinness World Records for serving the most boxed lunches in one day, approximately 76,000. Bidwell moved on to become Executive Chef at the Carter Presidential Center for Proof of the Pudding overseeing the off-premise division, where he managed all aspects of food production and oversaw culinary operations with revenues exceeding $2 million per year. Chef Bidwell’s culinary influence come from a combination of German, French, Asian and Italian. His mission at GICC is to provide only the freshest quality food with ingredients sourced from local and regional organic farms. He is passionate about creating consistent high quality cuisine, as well as, executing innovative dishes and creating unique dining experiences at the center. Chef Bidwell has catered events for US presidents, kings, queens and dignitaries from around the world during his career. As a result, he received numerous accolades including: Chef of the Year, First Place Ice Carver under his apprenticeship to the esteemed Executive Chef Hans Durst Master, Ice Carver. A few career highlights for Bidwell include preparing unique dishes for his majesty King Olav of Norway over multiple days, as well as, hosting a chefs’ table for the legendary French Chef, Julia Child.